Badr Al Samaa Group of Hospitals, the number one private hospitals group in Sultanate of Oman, has opened its first venture in Kuwait - the Badr Al Samaa Medical Centre in Farwaniya. 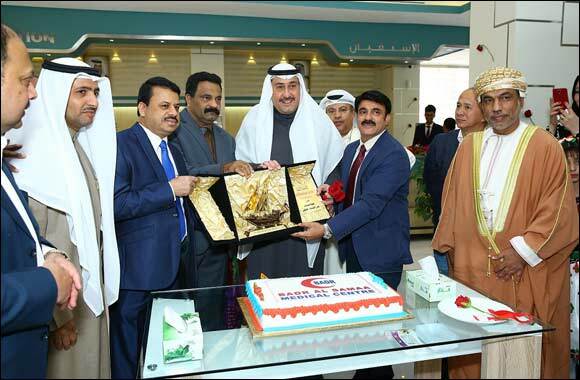 The Medical Centre, launched in association with Dr Nadeem Abdul Azeez Al Duaij, a dynamic and highly qualified Intensivist in Kuwait, was inaugurated this month by H.E. Sheikh Faisal Al-Humoud Al-Malek Al-Sabah, Governor of Farwaniya, in a ceremony attended by dignitaries, officials and community leaders. Mr. Abdul Latheef, Director of Badr Al Samaa Group of Hospitals, said: “Our vision to enter the Kuwait health sector was to establish a world-class multi-specialty hospital to cater to the needs of the nationals and expatriate communities in Kuwait. Badr Al Samaa Medical Centre, Farwaniya is centrally located and provides easy access for families. Our long-term plan is to establish 5 medical institutions in prominent areas of Kuwait in the next 3 years.” During the ceremony, the Group announced a special inauguration offer of 50% discount on consultations with all specialty doctors at the Badr Al Samaa Medical Centre until 31st March 2017. Badr Al Samaa Medical Centre, Farwaniya offers specialist treatment in Urology, Internal Medicine, Gynaecology, General Surgery, Pediatrics, Orthopedics, Ophthalmology, ENT, ,Dentistry, Laboratory, Radiology , 24-hour Accident and Emergency services, Ambulance services and a Pharmacy. Badr Al Samaa Group of Hospitals opened its first branch in Ruwi, Muscat, in 2002 and now has 9 hospitals across Oman, in Ruwi, Al Khoud, Al Kuwair, Barka, Sohar, Salalah, Nizwa, Sur and Falaj. It opened its first overseas hospital, Al Hilal Hospital, in Bahrain in 2007. Al Hilal now has 2 branches, in Muharraq and Riffa, with a third branch to open within the next 3 months. Badr Al Samaa also has a medical centre in Dubai, UAE and Doha, Qatar.